What Are the Treatments for Brown Spots on Legs? David Ochs spent 12 years as a radio announcer in Illinois, Missouri and Denver before a 23-year stint as a national broadcast sportswriter for The Associated Press. He's covered nine Olympics. It's likely you’ve heard a radio announcer reading one of his scripts. Since 2006 he has won multiple awards managing resource stewardship communications for the Fairfax County Park Authority in Virginia. 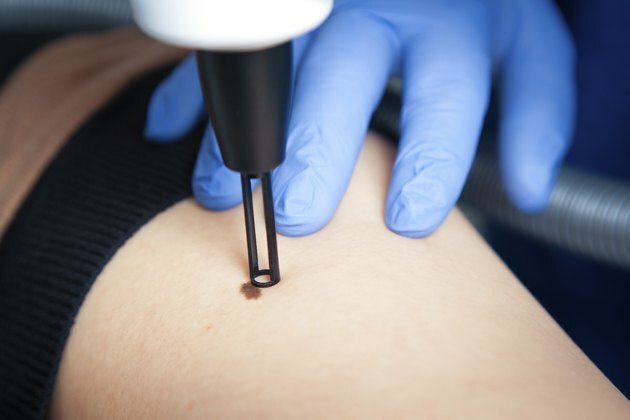 Know what you’re dealing with before starting any treatment for brown spots on your legs. Many spots are completely harmless, but the Mayo Clinic warns that brown spots with darker speckles could be a warning sign of melanoma–the most serious form of skin cancer. Let a doctor take a look at any suspicious spots to get an expert opinion. Age spots, sometimes known as liver spots, are usually found on those with fair skin, but no one is immune. These brown spots appear on parts of the body that have seen lots of exposure to the sun. The Mayo Clinic says they can be as small as a freckle or more than a centimeter in diameter. If you don’t like the look of the spots, the Mayo Clinic says there are a number of treatments to try. There are prescription bleaching creams that can be used alone or with retinoids and a mild steroid. Laser therapy, cryotherapy and dermabrasion can all be performed to get rid of the spots. Mayo Clinic says chemical peels are another option. The peels literally burn away your old skin and make way for lighter new skin. If you want to try an over-the-counter remedy, Mayo Clinic recommends looking for a fade cream that contains hydroquinone, deoxyarbutin, glycolic acid or kojic acid. Freckles are harmless, but some people just don’t like the look. While freckles usually appear on the face and arms, they can be found on the legs, too, or anywhere the skin has been exposed to the sun. The Cleveland Clinic says lighter-skinned people and those with light or red hair are most likely to freckle. You can help prevent the little brown spots from appearing in the first place by limiting time in the sun and using sunscreen. If that’s not enough, the Cleveland Clinic says you can just cover them with makeup. The condition acanthosis nigricans sometimes precedes diabetes and can cause tan or brown areas to appear on the neck, armpits, groin, hands, elbows or knees. If diabetic dermopathy is the cause of the spots, no treatment is generally prescribed. Dermopathy often appears on the front of the legs as red or light brown, scaly patches. What Are the Causes of White Spots on Tan Skin?